My name is Angela Bivens. I am 33 years old. I was born in St. Louis, MO; I moved to Georgia when I was about 12. I compete raw. I’ve competed twice in the 148-lb. class and currently in the 165-lb. class. My most recent competition was the 2014 Battle on the Border in Denver, NC; I came in 1st place in the 165-lb. class. I broke state records in the squat, deadlift & total; which I originally broke at the 2013 Georgia State meet. I also broke the American record deadlift for my weight class. My 1st competition was the 2012 Georgia Games. I’m looking towards doing the 2014 Raw Nationals. What do you plan on doing differently for that meet, if anything? I will continue to train hard. I live in Marietta and train in my basement. We have a lot of dogs and a cat, so I spend a lot of time spoiling them. I also like to read and ride my bike. That would also have to be Steve. J I was introduced to powerlifting from the moment we met. I went to most of all of his competitions, always thinking that I would never do anything like that. The way he would zone in on what he was there to do was always amazing to me, and it still is to this day. He tries to instill that into anyone that he trains for powerlifting: stay focused on your goal at hand. I also like hearing / seeing other powerlifters doing good, giving back to the sport in some form (volunteering their time, helping other lifters, etc.). I have endometriosis, which is chronic pelvic pain that affects many parts of the reproductive system which can be very debilitating at times. I wish all the different federations could be combined into just a few where the rules were the same for all lifters despite their status in the sport. What is your occupation? Does it interfere with competing or vice versa? I’m a vet. tech. ; working with animals. It hasn’t really interfered with training too much. We’ve been able to make it all work…so far. I’ve been competing for 1 ½ years. 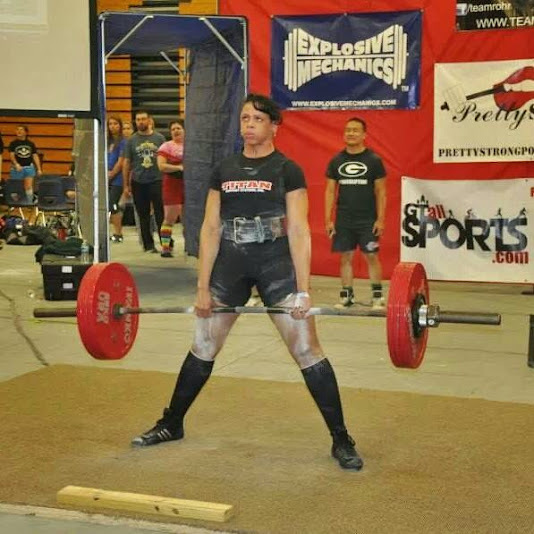 I got into powerlifting through my fiancé, Steve Goggins, who is now my coach. I was bored with my other workouts, so he suggested that I give powerlifting a try, though never a thought of ever competing. I haven’t looked back since. Steve is the Georgia state chairman for the USPA, another powerlifting organization. We put on meets throughout the year. My training numbers don’t always reflect my competition numbers; more adrenaline in a meet than in training. Do your research on coaches. Don’t just listen to someone who says you’re strong, that has no powerlifting background. Work with someone who’s willing to push you and willing to take you to the next level. If you compete, always see if your coach (if you have one) can go with you or if there’s one willing to help you…it will definitely take off the stress of picking your own numbers. Aside from the obvious, Steve Goggins, I don’t really have any favorites, per se. I just love watching lifters on the platform, giving their all and reaching their lifting goals. I put on heat and stretch, then start warming up based on what we’re doing that day. Since I’m still fairly new to the sport, it’s whatever Steve says to do. If there are other people training with me, Steve will usually go over the plan for that day’s training. What gets put on the bar is what’s done. He makes adjustments as necessary. Squat. Something about putting heavy weight on your back, going down and being able to come back up with it. Kimberly Walford. I haven’t competed against her; I just think she’s such an amazing lifter and look forward to sharing the same platform with her one day. Myself, it’s always me against the weights. Anyone can be considered a rival no matter what. It’s up to you to do your best. Making it into the top 3 in my weight class in the nation. Always do your best, don’t let anyone hold you back from your goals, whatever they may be. Trust & believe in yourself and your abilities.